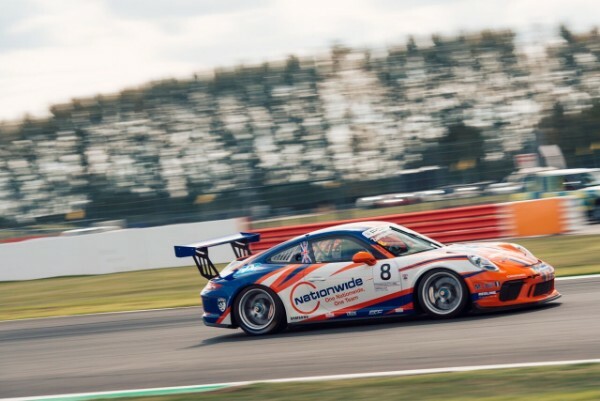 Dino Zamparelli (Redline Racing) overcame intense competition to claim pole position in qualifying for Round Thirteen of the Carrera Cup GB championship at Silverstone. In a quick-fire exchange of fastest lap times towards the end of the session, Zamparelli, Tio Ellinas (Slidesports Engineering) and 17-year-old Porsche GB 2018 / 2019 Junior, Dan Harper, ended Saturday’s qualifying separated by just 0.060s. Championship rivals Zamparelli and Ellinas will share the front row for the first of tomorrow’s races on a weekend that will prove pivotal in their pursuit of title glory. Harper made an early bid for pole position during the dry and sunny session on Silverstone’s National circuit, the Junior traded times with Zamparelli at the top of the table with Lewis Plato (JTR) close behind in P3. The second half of the qualifying session saw Tom Wrigley (JTR) and Ellinas join the battle with minuscule margins between them throughout. Less than three minutes before the end of the session Zamparelli moved 0.039s clear of Ellinas to clinch the fifth pole position of his Carrera Cup GB career. The battle for Pro-Am category honours was too close to call for the majority of the 30 minute qualifying session. Category championship points leader Jamie Orton (JTR) led his rivals early on with Esmee Hawkey (GT Marques), Seb Perez (Amigos Team Parker) and Dan Welch (Welch Motorsport) close behind. The final order saw Welch quickest from Orton and Perez, but all three were covered by an almost imperceptible 0.031s. In the closely contested Am championship battle, Peter Kyle-Henney (IN2 Racing) secured a crucial pole position over his title rival Peter Mangion (Team Parker Racing) who will start second – as has been the case all season long, there was little to choose between the pair during qualifying, but crucially for Kyle-Henney he will have Pro-Am runner Justin Sherwood (Team Parker Racing) between himself and Mangion. Carrera Cup GB returnee David Shaw (G-Cat Racing) will line-up for Round Thirteen in third position in the category, however he races this weekend as a Guest entrant and will therefore not qualify for championship points. Under the revised 2018 Carrera Cup GB race format, Zamparelli has already earned two championship points with his pole position, as the top qualifiers in their respective categories – Welch and Kyle-Henney – also receive two points each. The grid for tomorrow’s second race will be decided immediately following race one. The overall winner will draw a number between four and six at random, deciding whether the first four, five or six competitors will have their grid positions reversed. The remaining drivers will form the grid for race two according to their finishing positions in race one. Round Thirteen will take place tomorrow, Sunday 16 September, at 11:15, while Round Fourteen will take place at 16:30.